If you are looking into pocket doors and pocket door installation, read our guide on the cost, a quick how to and free quotes to hire a contractor. You may have heard of the phrase before or you may not. A pocket door is simply a sliding door that slides back into the wall cavity when opened. They are hung from the top by means of a rail which is mounted on the door frame header. They used to be very popular in wealthy houses from the end of the nineteenth century to the mid twentieth century. Sometime around 1950, architects and designers decided that pocket doors were too awkward and difficult to fit and maintain. As a result, pocket doors became a rare feature in newly built homes. Although the concept behind pocket doors was quite brilliant as you were not wasting floor and wall space on side hung doors, the technology of the time meant that unfortunately they were more trouble than they were worth. In recent years, the technology has improved considerably and now we have pocket door kits readily available using modern plastics to provide problem free running gear. 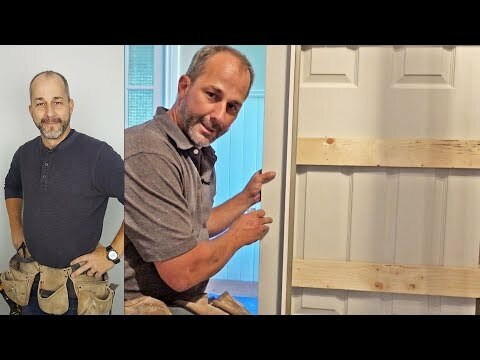 Installing pocket doors is now quite accepted in new build projects or a major remodel but to do it yourself is a difficult job unless you are expert in DIY skills. Pocket doors are useful if you have small rooms when you can’t afford to lose wall space. A normal hung door uses up a lot of floor and wall space that cannot be used for anything else. When the door is opening or closing the door sweeps an arc of a circle of the same radius as the door is wide. You must always leave this floor area clear of furniture and if the room is small this can be a nuisance. They can be used as room dividers to separate a large open plan room into two smaller more intimate rooms. They are sleek and streamlined and give the impression of planned elegance. What about the structural integrity of the wall? Obviously the type of wall you have will have a bearing on whether you are able to fit a pocket wall. Solid masonry walls will be no good as you need to have a cavity of a certain width to fit the thickness of the door. Pocket doors only really work with stud partition walls (drywall if you are in the USA). In a normal timber stud wall the thickness of the wooden header piece (wooden lintel) above the door need only be the same dimensions as the rest of the framing timber. The pocket door hangs from a rail which is fitted to the header. The entire weight of the door is supported from this timber so it will have to be of suitable dimensions to cope with the weight. Pocket door kits always give instructions on how large the header piece should be to provide a suitable support so always consult the recommendations before starting to build the framing in case you have to strengthen the header. The cavity which hides the door when it is in the open position is enclosed by plasterboard. There aren’t any studs present because there needs to be an opening large enough to accommodate the size of the door. This means there is less support for the plasterboard than in a normal stud wall so it will tend to flex and wobble more. The need to keep the pocket cavity free from obstructions means that you will not be able to fix anything to the wall requiring wall fixings that will protrude into the cavity. To do so would either stop the door from opening and closing properly or would damage the door as it moved past the fixing. If you are intending to build your own home or are planning a major remodel, it would make sense to consider using pocket doors in some of the smaller rooms. If you do there are a few things to consider when you are starting to plan the work. To install a 36 inch pocket door would need an opening of approximately (36 x 2)+1.75 inches = 73.75 inches. If you intend having a double door system with them meeting in the middle and disappearing into two pockets then you need to double the estimated width. The estimated height for all pocket door installations would be about 85.5 inches. Hidden problems. Before you start to knock down your wall check that there is nothing hiding inside the walls such as electrical cables, plumbing pipes, telephone cables or air vents. If you find some then it doesn’t mean you cannot build your pocket door in that wall, it just means you will have to think of some way to divert the services away from the pocket, before you start the project. Remember that this will create additional work and expense. Load bearing wall. In order to build your pocket door, you will be removing or at best partially removing an existing wall and you need to know if the wall is load bearing or not. Load bearing walls usually run perpendicular (at 90 degrees) to the floor joists in your house and always either support joists or support load bearing walls above. You need to know which way the joists run in your home so get up in the roof space or in the basement and have a look for yourself. This will give you a good idea as to whether the wall is loadbearing. If it is, you will need to work out the best way to provide support for the upstairs storeys while you remove the old wall and then you will have to decide on the structural properties of the new stud wall to take its place. You will need the advice of a structural engineer or architect to give you details of timber specifications and dimensions to take the place of a load bearing wall. Pocket doors are not used as much as they could be. Many contractors and householders have anecdotes to tell of their experiences with pocket doors and we will just go through a few of them now. Operating the doors makes noise. Many people say that the sound of the wheels running along the hanging rail and the door running in the floor channel is very loud. This noise may be just about bearable in normal living rooms with carpet and lots of soft furnishings to absorb the sound but if fitted to a bathroom with hard surfaces everywhere, the noise can travel throughout the house, especially at three o’clock in the morning when everyone is asleep. Good quality kits however use nylon and other plastics as moving parts and these result in a reduction in the noise factor. Noises at the end stops. Unless the doors are controlled throughout the operation, they can create a loud impact when hitting the door stop when fully open and when fully closed. House settlement. Good door operation depends on the correct alignment of the hanging rail which must also be kept perfectly horizontal. All houses settle over time and any movement of the components making up the door mechanism will prevent the door from operating properly. Derailment. Sliding doors in general can easily become derailed, not only from structural movement of the supporting frame but also if the door is handled roughly. Once the door has derailed it required the services of someone who knows what they are doing to put it back as it should be. Good quality pocket door kits use running gear that is almost impossible to derail. They are difficult to fit. Even the most experienced carpenter can have problems with fitting sliding doors, so a lot of architects, carpenters and general contractors would rather not be put in a position to specify pocket doors in the first place. Although pocket doors are a very simple concept, and have a lot of advantages with their design, they also have few disadvantages as well that you need to be aware of before choosing to install one. Clearance. Normal hinge hung doors always need clearance to be able to open the door fully, in fact at best they need a full semicircle or at the worst a quarter circle with a radius the same as the door’s width. For a normal 2ft 6 inch swing internal door you lose anything from 5 to 10 square feet. A pocket door solves that. Wall space. As well as clearance into the room you also need a wall area of the same area as the door to be able to open the door fully. This isn’t always possible when every inch of wall space counts. A pocket door doesn’t need wall space so you can have that piece of furniture or the picture up against the wall. Aesthetics. Pocket doors look streamlined and elegant especially when they are stylish glass. Convenient. If you have a large open plan room, pocket doors can effectively turn the large room into two small rooms when needed. For example try having double pocket doors to turn a large open plan dining room / lounge into two smaller rooms for more intimate occasions. Not a good seal. Because sliding doors do not fit as tightly as hung doors, you will find that the pocket door does not seal smell, noise or light as well as hung doors. For example bathroom and kitchen pocket doors can allow smells to waft into the adjacent rooms..
Not fireproof. Because of the poor sealing around pocket doors, they are not suitable as fire retardant doors even if the door material is. The gaps will easily allow smoke to transfer into an adjacent room. Wall strength. The wall opening required will be approximately twice that of the door’s area. Yes half of that is enclosed by drywall plasterboard but because there are no studs to strengthen the area, the board will tend to be very flimsy and may wobble when pushed. Because there is no sound insulation in the ‘pocket’, there is very little sound proofing. Fit for purpose? Pocket doors, as with all sliding doors go wrong. They often fall off their hanging tracks, sometimes have problems moving them open or closed, difficult to operate the lock properly and the rolling gear can be noisy. Accessibility. Hardware for sliding pocket doors is difficult to use if the user has limited hand and arm use. The overall opening and closing operations need more dexterity because of the recessed handle as compared with normal hung door hardware. Installation problems. Installation of pocket doors are much more difficult than a normal swing door. If there are any deviations on calibration of the internal frame or the track settings then doors will not run smoothly. Maintenance problems. Swing doors just require the door to be removed from hinges before maintenance but pocket doors can be really difficult to remove and replace onto the rails as well as fishing for loose objects lost in the recessed pocket. What items will you need to buy? The tools needed to install a pocket door are those which are found in most DIY enthusiast’s toolboxes. These together with the materials bought from most good hardware shops or home improvement centres make installing a pocket door an affordable and do-able project for the experienced amateur home carpenter. Spirit level. Ideally you will want a long spirit level of about a metre long as well as a smaller boat level. Paintbrush. As well as a brush you will also need sandpaper and the correct paint to give your door, casing and trim some coats of paint to make it blend in with the rest of the room. Tape measure. You will need one of these in just about every DIY project so have some handy. If you are anything like me, I always put mine down and forget where I have left it. Because of this I have a few in my toolbox so I always know the location of at least one of them. Hacksaw. You will need this to be able to cut to length the metal covered split studs as well as the sliding rail if necessary. Crosscut saw. A saw able to easily cut framing timber is an essential when building the pocket and cutting door lining to size. Utility knife. A knife is always useful when dealing with gypsum plasterboard. Dustmask. You will be cutting wood and plasterboard so you will be producing dust. Always protect your lungs from small airborne particles or you will regret it when you are older. Door lining timber. You will need enough planed timber of dimensions 1”x 5” or 1”x 6” or whatever will match the finished width of your wall to provide two jambs and one header. Framing timber. Framing timber the same dimensions as the studs within the wall will be needed. Also you will need a timber lintel from which to hang the running rail. You will need to look on the instructions supplied with your kit to find out the most suitable cross section to take the weight of your door. Door. The type of door required is really up to you, bearing in mind the style, weight and dimensions. Don’t forget to match the weight and size of your door to the kit you intend to purchase. Pocket door hardware kit. Purchase the best quality you can afford to ensure low maintenance later on. I have spoken enough about this in other sections of this article so I won’t repeat myself again other than to say that you should match the hardware to the weight of your door. As always there are many tips which will make pocket doors easier to install. Use solid doors. Any door that could be installed as a hung door can be installed as a pocket door. The weight of solid wood doors can be a challenge to the successful operation of the runner hardware while the hardware will tend to be pulled out from hollow core composite doors. Build your wall to the correct thickness. Rather than a standard 2ft 4 inch thick wall, use a 2ft 6 inch wall whenever possible. Not only will the door opening be stronger but also there will be more opportunity to install wall fitments such as towel rails. Don’t allow wall fasteners to protrude into the pocket. Often wall fasteners can accidentally protrude into the pocket space and make contact with the door. This can either prevent the door from moving or damage the door. Both cases mean that the wall will need opening up to fix the problem. Choose a skilled person. A person with experience in installing pocket doors needs to be chosen, as they will be aware of all the things you can and cannot do during installation. If you want to replace your normal swing doors with pocket doors you have a few problems which need to be overcome first. ✓ You will need a larger opening for the pocket door than for a normal hung door. In fact it will need to be approximately twice the width. ✓ The door hangs from a rail fixed to a horizontal head frame timber. You will need a larger head timber in the framing to allow for the weight of the door being supported. ✓ Electrical fittings (light switch) may need to be moved depending on the position of the switches. ✓ Air conditioning vents may need to be moved to allow for the pocket location. ✓ Accommodating all these points will probably mean that it is easier to build your wall from scratch or have a major modification rather than try to adapt an existing wall. Use the following instructions as a guide only, you should always use the instructions supplied by the manufacturer. ✓ Measure the size of opening required to incorporate door, pocket and frame. ✓ Draw the outline of the required opening. ✓ Make sure there are no obvious electrical switches or cables in this area. ✓ Mark on the plasterboard where the wooden studs are situated. ✓ Remove the drywall board using a saw and utility knife as far back as the next vertical stud. This may be larger than the required opening. Use a straight edge if needed. ✓ Remove any wooden studs that are within the proposed area. Try to do as little damage to the existing plasterboard as possible. ✓ Take out any old nails and clean up the dust. Check on the manufacturer’s instructions the dimensions required to allow for the height of the header rail, height of the door and the floor guide. ✓ Using a pencil, mark on the studwork where the doorframe (door lining) is expected to go and mark the thickness of the door lining. ✓ Ensure the floor is horizontal. If not then insert shims to bring the floor guide up to horizontal. ✓ Cut the required length of header timber to go between two studs. The depth and height of the header must be at least the dimensions specified by the manufacturer for the weight of door. ✓ Fix the header between the two studs at the correct height to allow for the lining to be installed afterwards as well as the door to hang and the shimmed floor guide to be fitted correctly. Make sure the header is as horizontal as possible. ✓ Cut and fit the vertical stud framing at each side of the opening. Don’t forget to allow for the width of the door lining as well. Ensure the studs are vertical. ✓ Fit the door lining onto the header and studs using screws. Ensure they are vertical and horizontal wherever necessary. Use shims to pack them out where necessary. ✓ Attach the split studs. The edge of the pocket is supported by a ‘split stud’. This component functions like a normal vertical stud except that they have half their thickness wrapped in aluminium to provide strength and forming a hollow channel through which the door slides. Attach the split stud to the head and to the floor making sure it is vertical and parallel to the other vertical framing pieces. ✓ Attach the rail brackets to the top of the vertical studs. ✓ Fix the top rail to the brackets making sure it is horizontal. ✓ Attach the hanging brackets to the top of the door. ✓ Slide the wheels into the track. ✓ Attach the door to the wheels making sure the brackets are clipped onto the pins extending from the wheels. ✓ Allow the door to hang vertically and mark where the floor guide should be installed. Now is the time to install the inset door furniture that came with the framing kit. Make sure the furniture does not block the door’s operation. ✓ Measure, cut and fix new plasterboard drywall to enclose the pocket. Make sure the edge of the drywall fixes to the split stud but ensure the fixings do not go all the way through the split studs and protrude into the cavity. If necessary use construction adhesive to glue the board instead. ✓ Measure, cut and fit the trim around the door lining. Make sure the fixing nails do not protrude into the pocket and damage the door while opening or closing. Most doors have a latch or lock fitted to ensure some privacy and to stop the door from inadvertently opening. A pocket door is no exception and you can install special sliding door locks. We will now run through the steps necessary to fit the lock. Use these instructions as a guide only, you should always use the instructions supplied by the manufacturer. The first step is to mark on the door where the holes need to be drilled. The size of the holes and exactly where they are situated will depend on the size of the lock. Usually, and in case you have no other indication of the position, you can fit the lock about 36 inches above the floor. ✓ At the desired height from the floor mark in pencil on the door face a place that is the width of your locking unit plus 1/8 inch from the edge of the stile (the proper name for a door edge is a ‘stile’). Draw two diameters of the circle based on that centre point at 90 degrees to each other. This will form a cross showing the position of the circle’s circumference. If you can draw curves freehand then try to draw the circle based on that centre point but it isn’t really necessary. The positions marked on the arms of the cross will be equal to the width of the locking mechanism. ✓ Transfer the same points onto the other face of the door so that eventually you can drill from both sides of the door. ✓ Now move to the edge of the door and at the same height from the floor as the other marks, draw a mark at the precise centre of the door stile. ✓ Draw a cross on the door stile centred about the pencil mark with the length of the cross arms representing half the width of the latch bolt (this means that the distance between the ends of the opposite cross arms will be the same as the width of the latch bolt). ✓ Mark on the door stile the perimeter of the latch plate. This will eventually be cut out to provide a recessed mortice to house the plate. We are now going to bore the large hole on the door face. ✓ Choose the correct size drill bit for the required hole and proceed to drill the hole from one side of the door face. When the bit reaches halfway, swap sides and start drilling the same size hole from the other side of the door. This will make sure the door face does not splinter when the drill bit emerges from the hole. You have now drilled a hole half way through the door from each side. ✓ Choose the correct size drill bit and drill the required hole on the door stile for the latch bolt. ✓ Drill pilot holes for all screws. ✓ Using a chisel cut away the mortice (about 1/8” deep or thereabouts) for the latch plate. Check that the latch plate will sit in the mortice and be flush with the surface of the stile. We are now going to push the latch bolt into the recess we have just cut. ✓ Depress the latch and push the whole locking mechanism into the large hole we bored earlier. ✓ Release the latch to check that it clears its hole and does not stick. ✓ Fix the lock in place using the screws. ✓ Fit the latch plate with the supplied screws. The strike plate is the plate that is fitted to the jamb onto which the latch bolt connects. ✓ Close the door and allow the latch bolt to make contact with the door jamb. ✓ Using the same size drill bit as you used for the hole on the door stile, make a hole in the door jamb. ✓ Offer up the strike plate over the hole and draw around the plate. ✓ Remove the strike plate and cut away the wood inside the pencil mark to a depth of about 1/8”. This will allow the strike plate to sit flush with the surface of the door jamb. ✓ Insert the strike plate into its mortice and fix in place with the screws. ✓ Open and close the sliding door a few times to make sure that everything fits and works correctly. If there are any problems, adjust the mechanism until everything works properly. 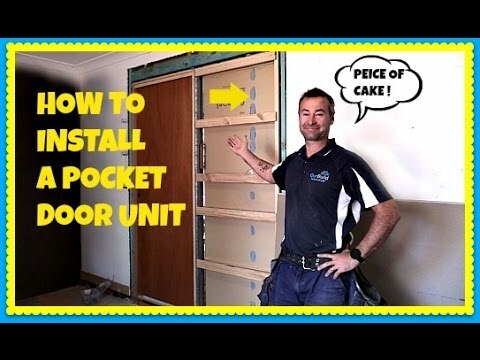 Can I use a standard door with a pocket kit? Weight. The weight of the door must not be greater than the weight specified by the manufacturer of the kit. Dimensions. The dimensions of the door must be small enough to fit within the pocket. Fire door. Because the door is not a tight fit when closed, it is no use as a fire door. Door material. Although it is possible to install an internal flush door as a pocket door, eventually the top rail from which the door hangs will work loose and may be pulled out of the door. Ready cut hardware. Doors with ready cut rebates and mortices cannot be used as pocket doors because the sliding door hardware would not fit. The cost to buy a pocket door kit will depend on the quality. Better quality kits, although costing more at the start will always pay back in ease of use and reduction in maintenance. For example a top quality heavy duty, ball bearing or nylon roller which is guaranteed to stay on the tracks together with aluminium wrapped split studs designed to stop warping, will pretty much solve all the negative comments aimed at pocket doors. You can buy kits designed to fit 2”x 4” or 2”x 6” stud wall construction. Kits cost in the region of between $150 and $400 and will cost between $350 to $600 for basic installation by a professional depending on how complex the demolition work could be. Remember that removing a stud drywall, dealing with any electrics, ventilation or plumbing services and rebuilding a new stud pocket wall could work out quite expensive and may well add an extra $2000 onto your original costs.. It isn’t just the installation kit that needs to be good quality either. The type of door and hardware such as flush handles and a locking latch need to be well made too or you will regret it when things start to go wrong later on. Standard internal flush doors can cost anything from $30 to $100 while a solid wood door may cost from $200 to $600 depending on style and manufacturing material. You will also have to purchase additional studs and lintel for the framing as well as a few sheets of gypsum plasterboard to make good the wall afterwards. If you have a pre-existing pocket door system and just want to replace the door (assuming there is nothing wrong with the runner and guides), then the cost will be in the region of $100 to $300 for DIY materials and will be well within the capabilities of the DIY enthusiast. If you need to hire a carpenter or handyman to do the job it should take no more than two hours of contracted labour costing from $200 to $500 parts and labour depending on the quality of materials, chosen materials, scope of work and where you live. When you go shopping for a DIY kit on how to install a pocket door, there are a number of things you should look out for. Instructions. Make sure the manufacturer has supplied well written and understandable instructions. Some manufacturers supply a DVD showing video footage of the correct installation method. These are indispensable and should not be sneered at. Even if you have installed a pocket door before, all brands are different and require specific instructions on how to install your particular type. What type? Pocket doors that use steel rollers tend to be very noisy and will often jump off the tracks. You should be looking for axle mounted nylon rollers or ball bearing rollers and metal tracks. Type of door? Most pocket door installation kits are designed for 13/8 inch thick hollow flush doors weighing anything up to 75lbs (34kg). If you choose a heavier door then heavy duty hardware will support 13/4 inch weighing up to 175lb (80kg). Because of this wide range of available hardware strengths it is possible to choose almost any interior domestic style door including flush, louvred, glazed, mirrored or panel. Maintenance? Your new pocket door will be sliding in and out of a hole in the wall for many years so you want one that is going to be relatively problem free. Choose a good quality kit costing as much as you can afford and don’t let a low price be the deciding factor. One inch or larger diameter plastic or nylon wheels. A roller track that is not only jump proof but also easily removable. Metal wrapped split studs so they are strong and will not warp. Accessible adjustments without having to remove the door casing or poke around in the pocket. We have already said that pocket doors are good because they allow you to have a door opening when there is little space available. By their very nature however, pocket doors do not fit tight in their frames and will always allow cold draughts and light pollution to invade your warm and snug home. To fix this problem you will have to learn how to seal the door to prevent cold air and unwanted light from entering and leaving a room. The first step in sealing your door is to identify what is causing the draught. Have a look around the pocket door and see if you can see anything obvious that might be allowing cold air to come through. Fixing the pocket gap. You will often find that the pocket in the wall is itself one of the biggest causes of cold air movement. You will have to find a way of insulating any gaps between the door and the pocket opening. The best way to attempt this is to use the brush type draught excluder which will mould themselves around the door and allow it free movement along its track while still blocking off any openings. These brushes will effectively stop any draughts in whatever position the door is left. Is there a gap under the door? You may find that another possible location for a draught is from under the door. You will realise by now that pocket doors fit into rails or guides fixed onto the floor which allow the door to open and close along a predetermined route. You can fit brush type draught excluders along the bottom of the door to prevent any cold air from this location. Is there a gap above the door? If you have a gap above the door you can fix this in exactly the same way. Another way is to screw lengths of 13/4” x 3/4″ timber onto the head jamb so it projects down past the top of the door. Is there a gap on the lock jamb? When the door is closed and is tight up against the lock jamb of the frame or lining you will see if there is any gap between the edge of the door and the door lining. There usually is a gap, so once again you can use brush type draught excluders or lengths of wooden doorstop screwed to the jamb. Test your seals. Once you have sealed everything obvious you will have to determine if you can still feel cold air. If you can, you will have to go over the process once again to see if anything has been missed. Light seals. In the same way but using slightly different seals, you will be able to block any gaps to stop unwanted light as well. Pocket doors are a brilliant idea and used to be very popular up until 1950. Interest in them declined as the fashion changed and people realised they were more trouble than they were worth. Recently with modern plastics and manufacturing methods it has been possible to produce pocket door kits that no longer suffer from the same problems and they are gaining in popularity once more. This article has told you a bit about pocket doors, their advantages and disadvantages and how to install them correctly. We hope you have come away from today’s article with some new knowledge or at the very least a different angle on something you already knew.